Combining theory, research, and application, this popular text guides college students on how to improve their study skills and become self-regulated learners. 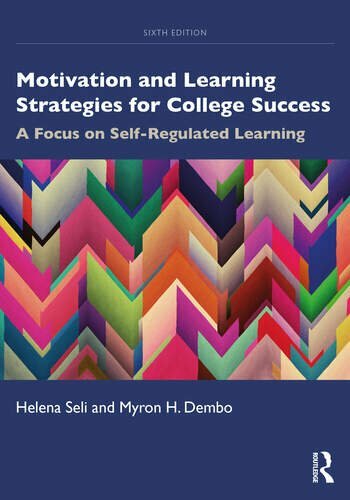 Seli and Dembo focus on the most relevant information and features to help students identify the components of academic learning that contribute to high achievement, to master and practice effective learning and study strategies, and to complete self-regulation studies that teach a process for improving their academic behavior. Motivation and Learning Strategies for College Success　provides a framework organized around motivation, methods of learning, time management, control of the physical and social environment, and monitoring performance that makes it easy for students to recognize what they need to do to become academically successful. Full of rich pedagogical features and exercises, students will find Follow-Up Activities, opportunities for Reflection, Chapter-End Reviews, Key Points, and a Glossary. Helena Seli is Associate Professor of Clinical Education in the Rossier School of Education at the University of Southern California, USA. Myron H. Dembo is Emeritus Professor of Educational Psychology in the Rossier School of Education at the University of Southern California, USA.